I’m extremely pleased to announce that the AfroCyberPunk blog has now been moved to a permanent home at afrocyberpunk.com. The domain name was purchased and donated by a Good Samaritan who read the blog and noticed that it was still unregistered, several months after the blog had been launched. The person does not wish to be named on the blog, but I must still express my gratitude for such an unprecedented act of kindness in this cyberpunk world that we live in. Please visit the new site to change your RSS subcriptions, or subscribe if you haven’t already. Many thanks to all the enthusiastic readers and retweeters of this blog who have helped to make it such a success, with over 10,000 hits already. We are that much closer to seeing African cyberpunk become a reality in the world of science fiction. AfroCyberPunk has now moved to a permanent home at http://www.afrocyberpunk.com. Q: Jonathan, What was it that first inspired you to write, and who are your biggest influences?A: I’ve always been fascinated by the concept of virtual reality and how media can be used to transport the mind into another world. I began writing because it gave me the ability to create worlds that others could enter as if they had stepped right into my imagination and I showed them around. For that reason, most of my earliest attempts at fiction were interactive hyperlinked stories. I owe many of my ideas to the ground-breaking work of countless writers and thinkers, so it’s hard to single out a few of them. My greatest single influence must surely be William Gibson, especially if the ripple effects of his work are taken into consideration. Q: Can you tell us a little about what you are working on at the moment. A: I’m working on a novel set in Accra, Ghana circa 2060 AD, at a time when clinical neuroscience has reverse-engineered the human brain and uncovered the inner workings of the mind. Two-thirds of the world’s population are implanted with biocores – organic computer interfaces between the brain and cyberspace which link billions of people worldwide to the Internet. The novel explores the psychological consequences of mind altering technology through the interwoven stories of a data thief, a computer programmer, and a cyber crime investigator who are drawn inextricably into the heart of a dark conspiracy in one turbulent night on the streets of Accra. First of all, let me apologize for taking even longer than usual to update the blog. I’ve been consumed with the not inconsiderable task of writing a novel and haven’t had enough time to find inspiration for a new article. Not to worry, I’ll be getting on that as soon as this current wave of procrastination dies down long enough for me to tear myself away from the novel. Which will be very soon, I promise. Vajra Enterprises, publishers of Fates Worse Than Death, is proud to announce that they have added Jonathan Dotse of the AfroCyberPunk blog as a consultant on the future of Africa. Jonathan Dotse’s new blog, AfroCyberPunk, has gained recent fame in the science fiction community. Jonathan’s insightful and well-written essays have made a strong case for Africa as the natural home of a cyberpunk-style society. At Vajra Enterprises, Jonathan will develop the future of Africa in its Fates Worse Than Death setting. With any luck Africa will become the next hotspot for science fiction publishers. On Friday, 4th June, Dagbladet, Norway’s 3rd largest newspaper (according to Wikipedia) published an interview with me on my thoughts about Africa’s future for its bi-weekly technology column. The interview was conducted by Martin Bergesen and originally appeared in Norwegian. Below is a translated version of that article. Is Africa about to develop into the dark hi-tech society we once dreamed about? The good old, forehead-slapping days of obvious “why-didn’t-I-think-of-that?” ideas aren’t past. This was Jonathan Dotse’s experience on 13th May this year when he revived the cyberpunk genre and took it to Africa via a blog post, only to be linked by God, everyman, Bruce Sterling and Warren Ellis (though not exactly in that order). Why the strong response? Well. If you were to say “cyberpunk” to the average science fiction fan nowadays, you might catch a wet glimpse of neon black nostalgia in their eyes. No wonder, for cyberpunk was simultaneously the most techno-romantic and dystopian genre sci-fi has ever seen. Its main ingredients were often a dystopian and polluted metropolis, with the populace oppressed by futuristic technology. The only bright side? Super-cool hacker rebels that used the technology to their advantage in the fight against the huge mega-corporations that had taken power from the states. In other words, deliciously gloomy. As a vision of the future, cyberpunk quickly became obsolete. As we entered a new millennium and the millennium bug (anyone remember that?) didn’t kill us all, the internet became a casual place where everyone connected through pastel-colored social media and paid their phonebills. Even cyberpunk godfather William Gibson, who predicted both virtual reality and the Internet in the 1984 novel “Neuromancer,” ended up writing about the present. It was exciting enough. In the face of web 2.0 we said our sad, but necessary, farewells to the future 1.0. But the cyberpunk future was not dead; it had only moved South, without anyone noticing. Anyone except Dotse, that is. The 22-year-old was born and raised in Ghana, lives in the country’s capital Accra, and is a budding sci-fi writer. – I studied at the University of Windsor in Canada for three years, and at first I could not imagine a sci-fi novel set in Africa, he says. It was only on the plane home to Ghana that Dotse had second thoughts. As he peered over the bright lights of Accra below him he realized that many themes from the genre he was so fond of were present here, right outside his front door. States that had lost control, severe corruption, private companies with ever-increasing power, and disillusioned but tech literate youth. – I saw a counterculture forming around new technologies. I saw the rapid technological advances that were changing the way ordinary people dealt with the world. And I saw a lot of unregulated access to technology. It struck him that Africa was already cyberpunk. Dotse is far from the first person to connect sci-fi with Africa. Both South African Neill Blomkamp’s action hit “District 9” and the Kenyan short film “Pumzi” view the continent through technological eyes. But Dotse’s perspective is fresh because it simultaneously feels nostalgic and relevant. His inspiration is mainly the technological relationship between the West and South. The Western world’s technological advances have been subject to laws and regulation. The trend has been gradual and has been tailored to user needs. In African countries, however, these technologies arrived fully developed, unrestrained by law and open to abuse. – The catalysts are access to high technology and the lack of an organizing framework. There may be variations in relation to income and availability of technology, but the common feature in each case is that the level of regulation cannot be compared with the countries the technologies were designed for. Although he is for technological advances, he is concerned about this lack of control. – In modern Africa, there is to some extent an acceptance of lawlessness, and therefore we are more dependent on each other than the “system” to maintain law and order. The problem is that this model is not particularly well suited to handle technology and the power it grants the individual to undermine the entire system. The effect of this bias, he said, among other things appears in terms of hacking. – Hackers here have almost carte blanche on what they can get away with. For instance the internet banking sector has been hampered for many years, simply because they feared the consequences of running normally. Much of what is going on is only known through rumor, since the police do not have the full capacity to deal with it. With so much free scope, it is not difficult to imagine what is going on in secret. Time will show what Africa’s technological destiny will be. Meanwhile, Dotse is busy writing his debut novel, a story set in the middle of the twenty-first century, when people have computer implants in their brainstem called “biocores” that manipulate their minds. – I want to explore what effects it would have on our humanity and our consciousness, Dotse explains. And where does the novel take place? In Accra, of course. Jonathan Dotse’s blog can be found at afrocyberpunk.wordpress.com. The most valuable natural resource to a society’s development is its ore of ideas. Much more than a brand of esoteric entertainment, science fiction has long been a source of prophetic knowledge that has influenced the destiny of humankind. From ‘1984’ (Orwell, 1949) to ‘Neuromancer’ (Gibson, 1984), the course of history has continually been altered by the ripple effect of this unique brand of ideas on our immediate future. Already a challenging art form, science fiction is rapidly growing in complexity in the age of high technology, as anyone imagining a future society is forced to explore the consequences of several new trends on innumerable disciplines interwoven through many layers of society. However, each accurate guess proves to be well worth the effort, to ever-increasing orders of magnitude. Of course, future prediction is old business, having been pursued by the most inquisitive minds throughout human history, from ancient Greek philosophers to our contemporary career futurists. Yet, in the widening grey area between the document in a scientific journal and the novel on your bookshelf, there lies a multiplicity of universes begging to be explored. Science fiction is a fragile network of bridges between the scientific world and the general public. It is hardly an easy task to expose the many dynamic relationships between the lab and the street, and less so to fashion them together into a coherent, gripping piece of entertainment. But when well-executed, it allows the average person to grasp the critical underlying factors of these relationships and gain some skill in uncovering these patterns on their own. Science fiction takes the thoughts of a few individuals and feeds them into the collective processing machine of an entire society. Instead of being confined to a roomful of academics, these ideas are freed into the Darwinian domain of coffee houses and dinner tables, to be prodded and picked apart from all angles until a refined vision resurfaces through natural selection. Under the guise of entertainment, science fiction spearheads the formation of vital discourses into the complex cause-effect relationships between technology and social phenomena, sharpening the collective awareness of trends within a society. The more people are exposed to these trends, the more they are inspired to study them, and the more they aspire to influence them for the better. You don’t know where you’re going if you don’t know where you’re from. Or is it the other way around? Simply knowing what problems lie around the bend spurs the proactive development of solutions before those problems have time to take root. As we visualize what could be in our future, we gain insight to the implications of the actions we take today, putting our current reality into a grander perspective. For instance, cyberpunk literature played a significant role in streamlining the regulation of information technology because of the huge discourse community that surrounded cyberspace as it was still in its infancy. The graphic detail in which cyberpunk described the possible abuses of the Internet provided specific objectives to achieve while guiding its development in the West. This is likely the most recent example of a highly probable scenario being averted just as it began to materialize. There are lessons in here for Africa to learn, particularly as a disturbingly similar kind of situation shows signs of appearing on our continent. And the learning process begins with the simple dissemination of an idea. A society without science fiction may be standing in the light, but is surely stepping into darkness. It is clear that exposure to science fiction today has a significant impact on those who go on to build the societies of tomorrow. Had African leaders of the past been given a glimpse of the effects globalized technology would have on our geo-political landscape, we would most likely be living on a vastly different planet today. As Africa marches onward into the future it is important that we as Africans begin to critically visualize the developments that will take place on our own soil. It’s not enough to import science fiction and translate it into the local languages. Our vision must be based on our own unique reality – cut from the cloth of our own societies and tailored to our specific needs. It’s about time our youth had a realistic vision of their future, so they know exactly what paths to follow and can be prepared for whatever lies along the way. Africa desperately needs science fiction to expand the frontiers of the African thinker’s imagination, to free it from the past, guide it through the present, and follow it into an unbound future. For a while, it seemed that cyberpunk was dead. The Internet counterculture of the West went mainstream faster than anyone could have predicted and the grim forecast of the cyberpunk movement became a self-defeating prophecy. Many dark realities were prevented from coming to be. Far from the sinister age of corporate dominance many envisioned, the digital era has liberated an entire world of individuals from obscurity, empowering them beyond their wildest dreams. However, this power didn’t come without regulation. The surveillance capabilities of the West have been well orchestrated to secure a significant degree of control over its citizens’ virtual lives. Its law enforcement continually strives to gain jurisdiction over the ever-expanding boundaries of Net, making it a far stretch from the lawless frontier cyberpunk predicted. But here in Africa, development has been dangerously asymmetrical. By the time any product hits our soil it’s already fully-developed and ready to be abused by the imagination. Technology designed for vastly different societies invariably trickles down to our streets, re-sprayed, re-labeled, and hacked to fit whatever market will take it. Regulation? You can forget about regulation. Whatever rules the creators imagined fly out of the window as freighters are crammed to bursting with the second-hand remains of their creations, damn wherever they’re heading as long as they can be cleared from port. Similarly, the Net’s architecture fails to reflect the reality on our continent as the expansion of cyberspace exceeds the reach of our road networks. How do you track someone who doesn’t have a social security number or a physical address? Someone who never really made it onto the Grid? It’s no surprise then that lawlessness is the rule on our end of the networks, ‘do what thou wilt’ the full extent of cyber-regulation. This will remain the case as long as Africa continues to wear hand-me-down systems; until she acquires her own truly tailor-made networks. With the huge logistical frameworks that need to be implemented, spanning vast swathes of geographical terrain, political regimes, and language barriers, a cyberpunk future for Africa seems all but inevitable. And even if we manage to overcome these hurdles, cyberpunk can never really die. There’s just too much human nature embedded within its code – it thrives on uncertainty and unpredictability, on severe human limitations juxtaposed with the radical and unlimited power of our own technology. It will always find a home somewhere on this planet until we collectively reach Utopia – if we ever do – whenever society grapples with brave new technology. We have not seen it’s last. You are not where you think you are. You are not on a safari, or an expedition, or a mission. Your footprint is not the first here, nor will it be the last. Africa is a tour with no guide and no schedule, a ride with no stops, no brakes, and no particular destination – there isn’t even a plan – so don’t bother booking a return trip; just go with the flow. If you are still looking for African science fiction, I advise you to put away your camera and open your eyes. Not the science fiction of your grandfather or the Foundation of your Asimov, no. Africa lends herself to the dystopian gloom of failed states, the iron rule of corruption, cartels snaking cold fingers into the upper echelons of government, and high tech gangs of disillusioned youth. Follow her streets into dark melancholy and taste her despair, the bitter and the sweet simmering together to form her unique flavor. Follow the trails of waste spilling out from her gutters, follow them down to the banks of her industrial empires, her charred forests, and damp mines. You will not find your Jedi warriors here, but you might run into some street thugs or hackers, scammers, drug dealers, con men and women, street children, ritual murderers, wandering evangelists preaching hope and doom. The only Force here is hard currency, and it’s dark on both sides. Embrace her reality. What wonders only Africa has seen since she gave us our crawling legs, released us from her nurturing arms to roam the wide outer world, soar up into the sky, the galaxies, and conquer the universe. She has always waited for us to return with our stories of voyages far and wide to add to her rich legacy. Bring her your stories. She will listen. Stand in the city streets or in the market, on the buses and trains, in the towns and villages, and broadcast your story out loud into the networks; fuel the pulse of life surging through the dense grid of veins all around you. Africa is waiting for you, because you are the future of African science fiction. 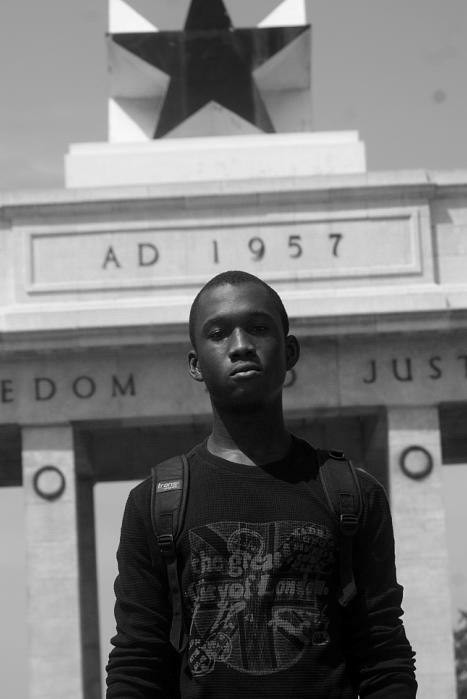 Jonathan Dotse (Doe-chay) is a professional student and aspiring science fiction writer living in Accra, Ghana. He is currently working on his debut novel, a cyberpunk mystery/thriller set in the sprawling metropolis of Accra in the middle of the 21st century. bandar togel on AfroCyberPunk Has Moved!